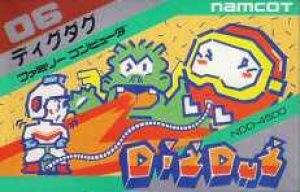 Dig Dug - Surprisingly, this version was never released outside Japan. 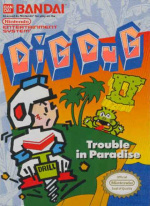 That game is Dig Dug, the arcade game from Namco where you control "Dig Dug" (Later officially named Taizo Hori), a digger tunneling his way through the earth in order to eliminate the monsters lurking underneath its soil. He can do this by either dropping rocks on them or by inflating them until they pop. Dig Dug is 600 points because of import costs. The other import is Bio Miracle Bokutte Upa. If you've managed to sample some of Konami's Parodius series you might know the titular character Upa - He appears in a few of them as playable character. Bio Miracle Bokutte Upa is a fun little platformer and well worth a look. It was originally released on the Famicom Disk System, then ported to the regular Famicom a few years later - This is the disk version. It costs 600 points. In the WiiWare section of the Wii Shop, you will be able to download My Pokemon Ranch later today. Visit WiiWare World for more info. I do not know this two games, but the second one looks good, I hope it come to the European VC soon!! Nice suprise. Finally you americans are getting proper games that you were lacking for ages. A very good week for the VC in the USA. Hmm, well I've never heard of these games before, but they do look kinda interesting.They probably won't get downloaded by as many people as Mother would though. Mother is the only import that has the potential to be downloaded en masse. No Mother, but you do get a Baby! I'll pass. I'd rather have Kirby's Dreamland 3. I like these tacky little surprises this week. Sure, it isn't Earthbound, but they'll win some of my money this week for these ones. No complaints ..
but i don't have any Wii points anyway. but hopefully a good VC doesn't lead to a lackluster WiiWare. Interesting week. I don't mind it one bit! I like how babies expect EarthBound and SMRPG every week now that they've been announced. besides north99 but he's not complaining. Wait, Dig-Dug was never released on the NES in the States? o.O I thought it was. People may have played Bio Miracle Bokutte Upa without realising it. Pirated copies did make it over to America where it was renamed Mario Baby (I know this is said in the comments for Bio Miracle Bokutte Upa). Mother is the only import that has the potential to be downloaded en masse. I love dig dug. Bio Miracle Bokutte Upa looks great. I already have Dig-Dug on Namco Museum for the GBA. That's wierd that Nintendo chose to release the version of the game that never came to the U.S. I used to play Dig-Dug on an arcade machine in the game room at this christian basketball hall when I was a kid. Well what other versions of Dig Dug could they have released on Virtual Console? As far as I can see on supported consoles, only Namco Museum 64 on N64 has it. @ NintendoBrad- games don't update until 12 pm eastern time. so another 12 minutes. zSMz, who's talking about just this article? Lurz. Anyway, quality imports = solid week. So it was true. Awesome, I'll be getting VC both games. I am glad to see more imports. I don't think I'll download either of these, but I am still glad to see them made available. Digdug is awesome! my opinion about rpgs mario and earthbound, personally I would rather have earthbound than super mario rpg but that is only because I have a cart of mario rpg (and the game can be beaten in 8 hrs or less). Great update, a little spice in the world of usually predictable and less than exciting VC releases. On a side note, will we ever be able to experience the commodore 64? Pokemon Ranch = Mii Channel. Boring, but creative. Surprisingly good considering Pokemon Ranch was released today as well. I thought for sure Nintendo would use it as an excuse to give us some throw away VC titles but these are actually decent. Color me shocked, but also a soon to be owner of Bio Miracle Bokutte Upa. Decent VC! And btw Ninty, you're getting closer with the whole "import" thing! great week dig dug and bio for me. @Objection_Blaster: I know how you feel. When I wanted Harvest Moon I was 100 points short and got a Wii Points card. Now I have 1900 points sitting on my Wii. On Topic: Good week for imports and nice to see a solid week. Interesting to see Pokemon Ranch was released even though it was expected to come out soon. Interesting. According to some news I read, Bio Miracle Bokutte Upa was released for Japan last week. Now, a week later, it has been released for US. It may be possible that, when Japan gets SMRPG, the US may get SMRPG in the following week. This is just wishful thinking, but you never know. It could happen. good thinking, I hope that happens! Don't count on it. Just because close releases happen once doesn't mean that it'll happen then. I mean, why did I have to wait a few months after you guys received Puyo Puyo 2 so I can finally look into it myself? Okay, these games are cool and all, but Nintendo needs to finally release this game http://en.wikipedia.org/wiki/Star_Fox_2 ..... c'mon Nintendo! I think close releases are likely for Nintendo titles. Especially the popular ones. You what? What's crappy about Dig Dug? And from what I heard, Bio Miracle seems to be a fun imported platformer. They may not be your cup of tea, true, but by no means they should be referred to as "crappy" just because you feel like it. Bio Miracle Bokutte Upa actually sounds like a pretty fun game. I'll have to download it when I get the chance. @will - Mafat Conspiracy would be a great release. I wonder if we'll ever see it....I guess most would think it is obscure, so maybe unless there are licensing issues I played and beat G13 Top Secret Episode and would love to spend some time going through Mafat Conspiracy. I'd normally be bummed, but it is an import set, so I'll just sit here, smile, and nod. Import support by Nintendo gives me hope that they're going to wow up with some more genuinely good JP-only SNES and TG16 games in the future.